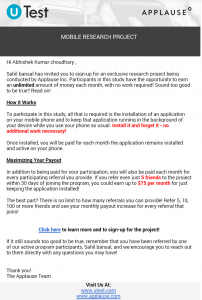 Facebook Research Program – Here is a good opportunity to earn some extra free money by doing this research project. 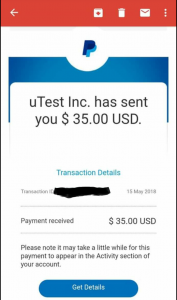 you can earn minimum $5 and $75 (if referred 5 friends) per month.They are looking for referrals of individuals in India to participate in testing of a social media app that works in the background of their mobile device. Note: Both USA and Indian Citizen can Participate in this Program so just send your Paypal Register Email address, Name, age and Country to us. Note: This is an Invite based program only and Working for Teenager only aged between 13-17 only. So Comment your, Name and 1 email Non-Paypal. Please use Age between 13-17 only at Registration Page. Else You will be rejected. At the Time of Registration, Put your Paypal linked email under Your Parents PayPal email address for Payments. Please come Fast for Referral !! To participate on the project, what participants need to do? Continue to use their mobile device normally with the research app running in the background. You will also get paid for each month your referrals keep the application installed and active!! Note:- Your Friend must joined before 10th Date to Get Paid (You as well as Your Friend) on 16th of Next month. If Joined later, Then He/She and You will be paid only if He Complete his 20 active days on Facebook Research App before 1st Date of any following month. Payment Date is 16th of Every Month. How to Register For Facebook Research Program? * At First You Need to Comment Your Full name, Paypal Email Address That Should be Same as Your Primary Email while Registering for the Program. *After that we will send you Email from that you can Register on the Program and participate. *After you get the Registration link for Signup on the Program, you can Refer your other friends too to participate in this program via that link too. *After Successfully Registering you will get App Install link on your Email address within a day. *just Install the app on your smartphone and forget it just keep the app installed and get each month minimum 5$ on your paypal. 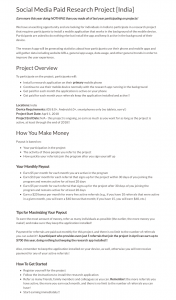 Project End Date: N/A – this project is ongoing, so earn as much as you want for as long as the project is active, at least through the end of 2018!! Maximize Your Payout: Refer Friends! Remember: You MUST keep the application installed on your device in order to receive payment for your participation, and in order to receive payment for your active referrals! In addition to being paid for your participation, you will also be paid every month for every participating referral you provide. If you refer even just 5 friends to the project within 30 days of joining the program, you could earn up to $75 per month for just keeping the application installed! What is Facebook Research App? Facebook research applause is actually a program by applause and is handed over to utest by onavo, Onavo is known as Facebook Israel and the parent organization of onavo is Facebook Inc. facebook research by applause is not the first research program launched that monitors data or your network. There were some other programs too that used to monitor data and pay one among them is Mobile Expression. As the Facebook Research App programs is made by Onavo, which is a owned by Facebook organization, so it is clearly a program by Facebook and Facebook already have access to all your data which you upload on Facebook or you also give permission to the Facebook to use your camera or to read your contacts. Actually you give these permissions to all the apps you have installed in your phone or which you use. So they have your permissions, can’t they use your data like paytm gave their user database to some agencies recently or like aadhaar card data was hacked etc etc. One thing which I want to tell you here is that they monitor network so they can understand how Facebook and internet is used in India and US. So that they can improve their services. Also, we share a lot of things on Internet especially on Facebook and WhatsApp and you have already given them permission to read your data etc etc. So there is no question about your privacy breach as they can use your data from there as well. The Facebook research app will be generating statistics about how participants use their phone and mobile apps and will gather data including website URLs, general app usage, data usage, and other general trends in order to improve the user experience. The company that is operating this project is Applause. Applause is a global leader in crowd testing, feedback and research. Our global community of software experts provide a full range of testing and feedback services, at a pace customers can’t live without. Is it necessary to keep the vpn on for 24 hours?